Every Business has the ability to choose its destiny. It is exercising this ability to choose, or not being able to choose, that determines the successes and failures for that business. I spent a good forty minutes on the phone last week talking with one of my favourite dental coaches, catching up and visiting with him. Among the many things that we chatted about, in terms of life and business and family and philosophy, my friend informed me that he was no longer coaching any clients now and had transitioned himself into full retirement mode and the role of grandparent. Funnily, when he made the decision to retire, my friend needed to terminate some long-term coaching agreements that he had with several clients. Interestingly, he mentioned that only recently some of those clients were still experiencing the same “problems” that they had had while he was coaching them. He said the reason for this was that those clients had failed to take corrective action and ignored those “problems” rather than addressing them and owning them. And now those problems were still there, and still present, sometimes bigger and worse than when they had originally been spoken about. In these sort of situations, the choice to ignore and the inability to choose a solution, or a path towards a solution, was indeed the wrong choice. How many times in your life have you been offered a choice that you have failed to act upon? How many times have you regretted not making that choice at a time when hindsight has proven that you would have been better off taking that action at an earlier time? Sometimes the action required, or the choice to be made, is to do something different. And other times what is required is the cessation of an action that is causing us damage and creating poor outcomes. These choices that we make or fail to make can be in our business lives and our personal lives. It could be the choice of whether or not to learn a new procedure to help our patients better? It could be the choice of whether or not to align our business with certain insurances or corporates or health plans, or whether to simply just go it alone? It could be the choice of continuing doing what you’ve always done and hoping for a different result, rather than setting a different course of action? Or it could be the choice of seeking advice. That advice might be about your business, or it could be about your investments, or your retirement? It could be advice about your health, or your habits, or your relationships? Or it could be sporting or recreational advice, like learning to run better, or swim better, or tennis or golf, or ballroom dancing, or blackjack? The thing is that every day we are actually exactly where we want to be, because if we didn’t want to be there, we would make the changes and try to be somewhere else. But we haven’t made those changes…. And yet, we have choices…. Are You Stepping Over Dollars In Order To Pick Up Pennies? Generosity is so rare that when it hits you, you take notice. But meanness is also very apparent. A lot of businesses do not realise that their customers are noticing their meanness. Have you ever visited a business where the pens are tied down or permanently attached to a counter or to a clipboard by a chain or a rope or a string? Wouldn’t it be smarter to have your business name, or better still, your business URL, on the pen, so that if the pen was accidentally removed from your business it would then be acting as an advertisement for your business? What sort of advertisement is your business making when it ties down its pens? Last weekend due to weather in the USA I missed my airline connection in San Francisco, and as a result I was put up in a hotel for twenty-four hours by one of the airlines. The airline also provided me with a whole seven dollar breakfast voucher along with a twelve dollar lunch and dinner voucher as well. At breakfast the next morning I ordered a juice and a cup of tea, along with two eggs and some toast. I had breakfast that morning with another stranded passenger who was also in the same predicament. I shared with him the story about my family dinner at La Giostra restaurant in Florence Italy, in 2011, where at the completion of our meal, the host had asked whether my wife and I would care for an after-dinner drink, on the house? Well how could we refuse his generosity? What followed then was an act of even greater generosity…. My wife asked for as Limoncello and I said I would like a Johnny Walker Black Label. The host returned, but not with two drinks, but rather with a bottle of each beverage and two glasses, and told us to have as many glasses as we cared to enjoy. Can you imagine how many times I’ve retold this story? Can you imagine how many other patrons who have experienced this generosity and have told and retold the same story? Do the math…. there is significant profit to be made by charging $12.00 for a 30mL portion from a 700mL bottle that costs the restaurant maybe $50.00 wholesale to buy? But who is going to go overboard and drink more than one or two glasses at the end of a great meal? In fact, if every diner had two glasses at the end of the night, one bottle would serve twelve diners. So for a fraction over $4.00 per diner, do you think giving away a couple of after dinner drinks is a great investment? How does this relate back to dentistry? In your dental practice, are you tying down your pens? Are you putting stickers on your magazines in the hope that patients don’t steal them? Could you be gifting something to your patients on a regular basis that encourages them to come back for more treatment more frequently than they do? Are you offering your patients cologne and perfume to freshen up following their appointments? Are you serving them fresh roasted coffee or herbal teas in fine crockery? Are you offering them fresh juice or cold bottled water? My next public speaking presentation showing Dentists how to grow their Dental practices will be with Jayne Bandy in Manchester, England on Saturday 2nd September 2017. Are You Employing Self Starters? I had breakfast last week in Manhattan with a very dear dentist friend and as you would imagine, the conversation turned towards the dental team, and we began to share some horror stories. I always try to meet up with my friends in New York as much as I can whenever I am in town here. This memory jogger event yesterday triggered a bad memory from the vault for me when I was in Manhattan maybe six or so years ago. My wife and I had been on a short ten-day trip attending meetings, and we had left two newly recruited front office people at our main practice to be supervised and overseen by a senior office manager from our branch practice. Our hygienists were seeing patients during this time, so all was supposedly meant to be good during our absence. What we found upon our return was an appointment book with massive spaces and gaps in my schedule. Our two newly recruited front office people were providing great customer service to our patients by allowing them to cancel and reschedule their appointments whenever they chose to phone in. And as such, appointments for treatment, necessary treatment, were being allowed to be put onto the patients’ “Someday I’ll…” list, if such a list even existed for those patients. And of course, our manager from the other office who was supposed to be supervising and overseeing the activities of these two new recruits was happily playing Queen Bee and watching these two employees self-destruct. What we did find that these two had accomplished during our absence was that they had taken upon themselves to clean out and tidy all of our cupboards and storage in the front office area, and to also label everything that could possibly be labelled with a Dymo label describing what each item was. Now, truth be told, our cupboards were in need of some reorganisation, but this was a task not to be performed at the expense of keeping a solid and productive appointment schedule for me upon my return. That was a big no-no, and it was also something that the Queen Bee from the branch practice who was supervising should have squashed on the head as being an inappropriate task. After all, has a new patient, or an existing patient for that matter ever asked to inspect the inside of your office cupboards? Photos of neatly stacked stationery are rarely seen on dental websites.. Overall, it was simply the wrong thing to be doing. And it was very poorly supervised. In your business, in your life, are you stacking the stationery instead of calling your valued customers and clients and patients and scheduling appointments with them? The only thing that pays the salaries in dental offices is patients sitting in dental chairs. In our business, and in all businesses, we do need to prioritise the activities that are going to keep the business open and put food on the table first and foremost. Are you doing what is best for your business? When Indifferent Service Will Not Do…. As you know I’m on the trip of a lifetime at present. Although I’ve been attending conferences and workshops and putting on meetings, later this week I’ll be ticking off a once in a lifetime moment that has been on my bucket list for more than twenty-five years. When I travel, it allows me to observe service and levels of service in businesses that I visit and in countries where I stay that I would not experience in regular downtown day to day business and life while at home. It is seeing these sorts of opportunities that allows me to fine tune the services that I provide in my business along with the services and standards that I encourage my clients to strive to achieve in their own businesses. Sadly, this scrutinising service DNA that I have been “blessed” with often allows me to witness and observe behaviours that ordinary everyday customers and clients may not even realise is occurring. What I’m noticing on this trip is an increasing number of moments when the employee serving is not even in the moment. I’m seeing employees acting robotically. I’m seeing employees on hotel counters looking sideways while speaking to customers standing right in front of them. In dining rooms and restaurants I’ve seen some greeters walking diners to their table and then not even waiting until those patrons are seated and comfortable before departing without even a sideways look, and not even letting those diners know when their server will be over. The other evening I dined alone and sat at the counter of a Japanese restaurant, and was made to feel totally invisible during my meal, despite the fact that I was sitting right in front of one of their computer registers. In fact the service at this restaurant was so bad that it was one of the rare times that I left no tip for the staff and also left them some constructive advice on their feedback form. Because most of the time when we as customers receive poor service at a business we often say nothing and simply choose to take our patronage elsewhere. This is one of the major reasons that businesses lose customers. Customers depart because of apathy, and perceived apathy from the employees of those businesses towards those valued customers. Businesses should only employ people with “a need to please” as their front-line servers and greeters. Nobody who is not invested in the customer should be allowed anywhere near a customer because the customer will interpret those employees’ behaviours as not being committed. We do need to see commitment from all of our team towards the customers’ wellbeing at each and every time that they interact with those customers. If employees are not invested into their customers’ moments, if they are not committed to “MAKING THE DAY” of their customers, then it is time to let those employees go work someplace else. It is the way that a business makes its customers feel each and every time that they visit that differentiates the truly great businesses from all others. Because your customers can easily choose to go elsewhere and be treated poorly for probably less than you charge. So make sure you only employ those people who are truly committed to being *Day Makers* for your customers. By doing this, your business will stand out heads and shoulders above all of your competitors. The Power Of Collaboration And The Quest For Improvement. As I mentioned in my previous blog post I spent two days last week masterminding in a basement of a home in Atlanta. For two very intense days, I, along with three other business owners, worked solidly from nine o’clock to five o’clock on our own businesses as well as each others’ businesses along with our facilitator, [or should I call him a coach?] crafting out some nuances that would help to improve each of our businesses dramatically. The two days was valuable not only for the content we received and the work that we achieved, but it also was invaluable for the experience of working intently with three other entrepreneurs and seeing their businesses and what they were both doing, and not doing. The workshop provided an excellent opportunity to not only gain tuition from our very accomplished coach on a very personal level, as well it also allowed me to gain feedback from three successful people from completely different professions and to hear what they thought about the things that I was doing to grow my business. I am seriously of the opinion that this workshop was so invaluable that I will seek out three business leaders in my local community with the goal of setting up a regular collaboration of a similar purpose. 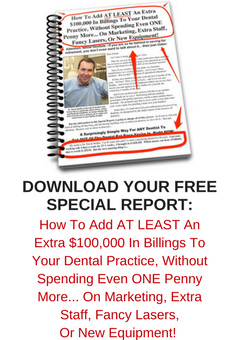 Do you think that something like this would be of benefit to you and your dental business? I’m thinking that it would probably be a most invaluable opportunity for you to work with and allow other non-dental successful people to share their thoughts both on your business and also theirs. Following on immediately after from this two days of incarceration in the Atlanta basement I flew on to Orlando Florida to attend an annual meeting of Dental Speakers, Consultants, Coaches, and Writers. It is a meeting that I attend regularly each year, and have done so since 2011, which means that I have been going now for seven straight years. This meeting is a bringing together of the “family” and “community” within the dental speaking profession. It is a chance for all of those road warriors or airport warriors and those with a vested interest in the success of dental practice in general, to get together for camaraderie as well as for education and learning. It is a chance to annually provide encouragement along with excitement to those who are working their way along the timeline from being a want-to-be dental speaker to becoming a true professional at their craft. It is an opportunity to share stories as well as to share pats on the back too. It is also an opportunity to be inspired, both by the speakers and their presentations but also by the tales in the hallways and during the breaks, along with the chats over a beverage or a meal at lunch time or also at the end of the day. Or are you an amateur? Are you committed, or noncommittal, towards your vocation? Are you on that quest for improvement? You know you should be, and you know you owe it to your clients and customers and patients, as well as to your family and to yourself, to do so. To improve, and to seek improvement. We cannot simply rest upon our laurels. We need to continually be seeking a better way….